Dimensions: 10 1/4 x 15 15 /16 in. *Impressions outside the edition: There are at least two and probably at least three impressions outside the edition. One is titled and annotated "first proof," l.l., and another "third proof". Both of these are signed and dated "28" l.r. Reproduced in: "Fifty Prints of the Year," 1929. 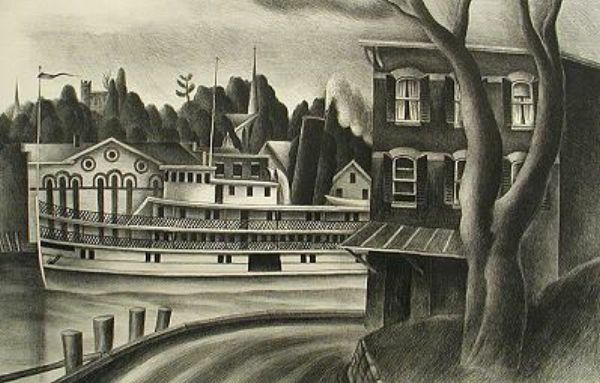 Setting: Rondout, the Hudson River waterfront district in Kingston, NY, is not far from Woodstock, NY, where Fiene was working and living for part of the year in 1928. According to the website of the Hudson River Maritime Museum, "Rondout is a fine example of a 19th Century waterfront district. Known as Kingston Landing until the 1820's, it had been a peaceful river port since the time of Hudson's voyage along the Hudson River. In 1828, Rondout burst into activity with the opening of the Delaware and Hudson Canal, and began to develop the kind of physical character it has today." To learn more about Rondout, click here. Related Works: A painting, oil on canvas, titled "Riverboat at Rondout" and dated 1928 was exhibited in an unspecified exhibition at the Museum of Modern Art (unpublished papers of Ernest Fiene).